Master Stylist and Colorist Sameer Nurani is the owner of Sameer Salon Orlando. He specializes in haircuts, blowout styling, colors, highlights, balayage, threading, razor cuts, and weddings. He has been a stylist for nearly 25 years. When Sameer isn’t creating beauty, he binge-watches everything on his DVR. He creates art (he’s a frustrated painter), hangs out in the woods with his husband and their dog on the RV. He would call it camping, but says it’s not camping if you have a microwave, internet and satellite TV. Sameer came to America in 2000 and became a United States citizen in 2015. This was his “proudest achievement.” Sameer realized his childhood dream when he came to America. He was excited to chase the American dream, someday own a salon, and go to Disneyworld. 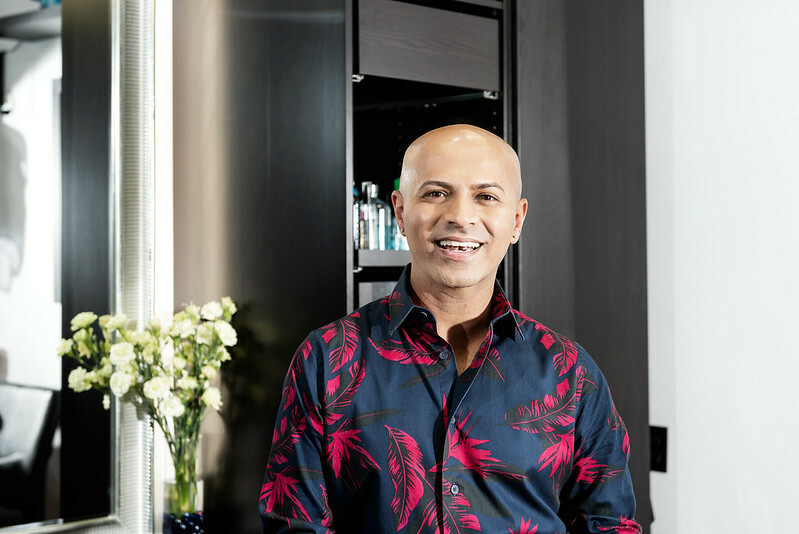 Sameer owned Q Salon in Dr. Phillips for eight years and loved it! Someone asked to buy the salon, and it happened to be the perfect time to move to the next chapter in his life. His husband did the research and sent him pictures and information about iStudio Salons. Somewhere on a plane between Dubai and Bombay, Sameer’s fate was set at iStudio Salons Dr. Phillips. Clients can book Sameer by phone (text and talk), he prefers to talk. He likes to hear the voices of his clients. Sameer says, “hairstyling is such an intimate and personal” and he believes that conversation enhances that.